Carved wood corbels and brackets can also add a special architectural touch to your kitchen decor’. These moldings are perfect for under a kitchen counter or island. There is also a large selection of on-lays. These are raised wood patterns you can attach to the surface of a cabinet or door to create a focal point or ornamental motif. On-lays bring a sense of depth and detail to flat areas. They can be painted or stained to match the wood tone of your cabinets and are easily affixed with hot glue. Here’s a good article to review on How To Restain Kitchen Cabinets. Another inexpensive way to jazz up your cabinets is by changing the hardware. You can easily trade your dated knobs, handles or hinges for something more sleek and contemporary or even something wildly expressive. One trip to a local supply company can start your head spinning with thousands of decorative knob and handle ideas. Don’t forget the toe kick areas of your cabinets. You can add grace and style with the simple addition of feet or ornate base mold. There are lots of creative ways to enhance the look of your cabinets without having to spend a bundle. And these simple adornments do make a difference. With just a few decorative touches, you will find that your otherwise bla kitchen cabinets are much more exciting. 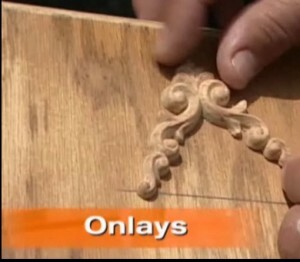 There are many places that sell decorative moldings. A good place to start getting ideas is at your local cabinet materials supply company. They usually have large display rooms that are loaded with various types of cabinet moldings.